Where is that llama going? To school of course! 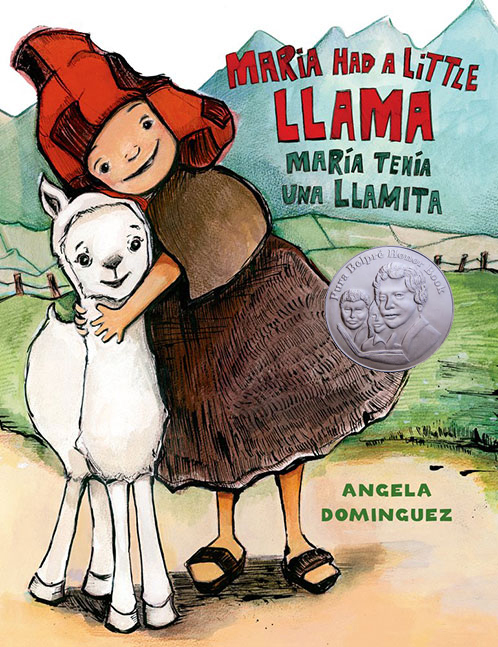 Maria Had a Little Llama/María Tenía una Llamita by author/illustrator Angela Dominguez provides a fun twist to the classic nursery rhyme, “Mary Had a Little Lamb.” The delightful illustrations in this book features majestic mountains, a lively Peruvian village, and a lovable llama. Enjoy this bilingual story in English, Spanish, or both languages! Activity 1: Llamas play an important role in Peruvian culture. Many children raise llamas as pets. Invite your child to talk about what kind of animal they would like to have for a pet. Singing nursery rhymes like, “Mary Had a Little Lamb,” helps children learn new words, and hear the sounds and rhythm of language. Cuéntalos conmigo, Count them all with me. Y uno más son diez. And one more makes ten. Activity 1: As you read the story, help your child discover various characteristics of the village like: people with instruments, fruit vendors, different animals, farmlands, mountains, and traditional Peruvian clothing. Explore non-fiction animal books to learn more about llamas! Life-Size Farm by Teruyuki Komiya – this book is filled with beautiful photos, and fun facts about llamas and other animals. Activity 1: What does the llama say? I don’t know; do you know? Ask your child, “What sound do you think a llama makes?” Have fun making silly animal sounds. Activity 2: Throughout the story we see village musicians playing traditional Peruvian instruments. Have fun with your child making homemade instruments. For instance, an empty oatmeal container makes a great drum. Pots, pans and wooden spoons make wonderful sounds too!